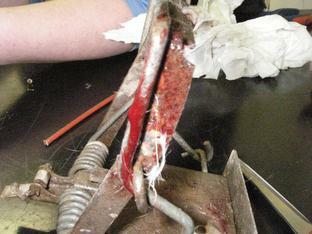 A CAT, which was caught in a spring trap in Cleobury Mortimer, may lose its leg after suffering “unimaginable” pain. The RSPCA received a call about the female, white cat on Tuesday after it was seen in a field at Mawley Town Farm. The cat’s injured leg was bleeding profusely. Inspector Mark Lewis took the cat to the vets where it is said to be eating well but is unable to use its leg. Vets will assess how badly damaged the leg is today in order to decide whether it can be saved. Mr Lewis said: “The pain this cat must have endured is unimaginable. We think the trap is a heavy duty ‘Springer’ trap. “Although these particular traps are not illegal for use against animals such as rabbits, it is a legal condition they are set in natural or artificial tunnels, which are suitable for the purpose. “This is to reduce the risk they might pose to other animals. The fact that a cat became ensnared in this trap would indicate that it was not set in a tunnel therefore could have been set illegally. “Unless set in accordance with the law such traps can be totally indiscriminate and any animal caught in these dangerous devices is likely to be seriously injured or killed. Calls can be made to the RSPCA national cruelty and advice line on 0300 1234 999.